We are now pleased to announce our first listing of Miniature Herfords for sale. After careful breeding, we have a number of calves (both heifers and bulls) and mature cows now available. Located at Lower Hermitage in South Australia, these miniature cattle are all available and ready to go now. We have Lisa and Zizi who are both 6 year old cows at $1,500 each, Morgana who is 2.5 years also at $1,500, Wilbur is 1.5 years old at $1,000 and Ronald who has just turned one at only $800. Please contact us for specific pedigree information. I will endeavour to list individual photos as soon as possible. I will be adding more photos very soon so bookmark this site so you can be the first to view the Miniature Herefords we now have for sale. 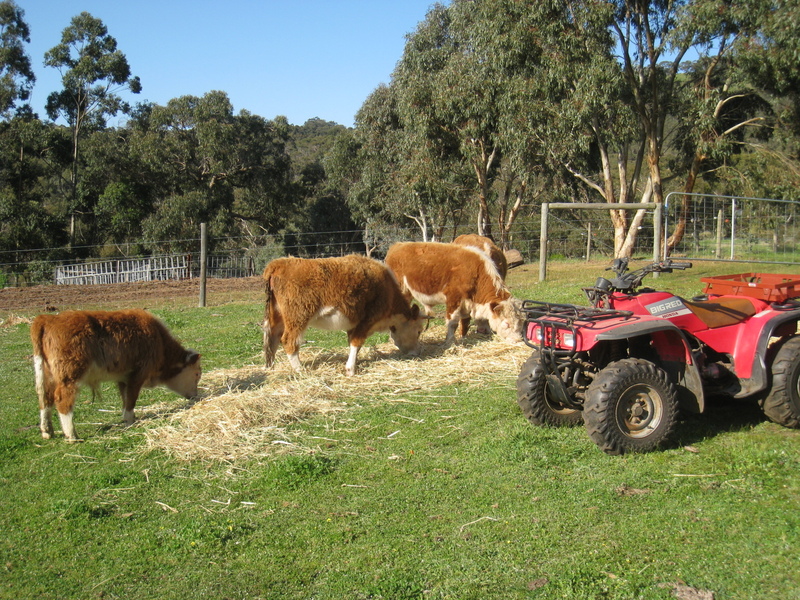 The photo below shows their relative size compared to the quad bike. This entry was posted in Uncategorized and tagged miniature herefords, miniature herefords for sale by oakdalemh. Bookmark the permalink.